Allison is the founder of trailtosummit.com which she began as a way to track and share her first round of the NH 4000 Footers. Now on round 5 (the first round for her dog Ruckus) she has been honored to have taken part of many people’s firsts. She is an experienced trail maintainer, speaker, and passionate member of the outdoor community. In New England, Allison enjoys trekking along the highest peaks, bushwhacking to less traveled areas, and has a fondness for sunrise and sunset trips. Outside of New England Allison has also thru hiked the John Muir Trail and explored mountains in the German and Austrian Alps, Israel, and the Azores. Her goal is to share her passion for hiking and backpacking with others, especially with women, to inspire them to experience the freedom of the trail! 1. Erik Asorson, 2014. Erik the Black’s John Muir Trail Atlas, 2nd Edition. Published by Blackwoods Press. Blackwoods Press Link. 2. K. Scott Parks (“Postholer”), 2014. John Muir Trail Southbound, Scale: 1:63,360. Free but copyrighted. Download link. 3. National Geographic Society, 2014. John Muir Trail Topographic Map Guide. Published by National Geographic. Amazon link. 4. Elizabeth Wenk, 2014. 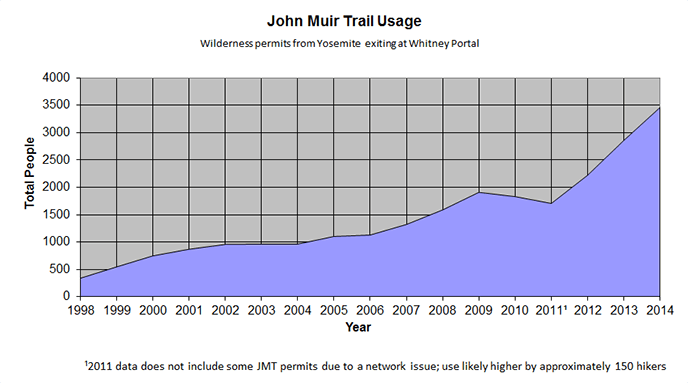 John Muir Trail Data Book. Published by Wilderness Press. Amazon link. 5. Tom Harrison, 2014. John Muir Trail Map-Pack. Published by Tom Harrison Maps. Tom Harrison Map Web Page. Roleigh Martin is the lead moderator, since 2011, of the 3600+ member group, the John Muir Trail Yahoo Group. He has written extensively on issues of interest to JMT hikers. He has done the JMT 7 times. He lives in Reno, Nevada and leads hikes there for the Sierra Club and is head of a Meetup Group focused on the JMT for people living nearby.